What would you do if someone asked you if a hot dog was a sandwich? Would you stand there and answer thoughtfully? 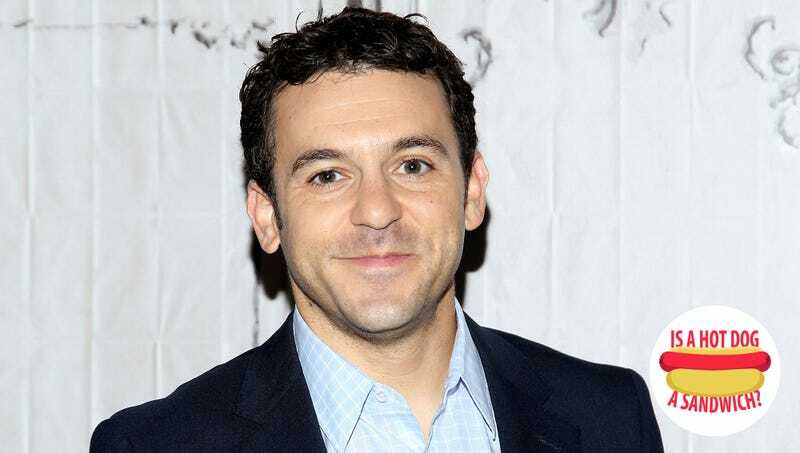 Lend me your eyes and I’ll type out what Fred Savage said. Child Support is a game show in which adults attempt to answer questions to win money. If they get a question wrong, the question then goes to a room full of children and Ricky Gervais. If the kids answer correctly, the adults get the credit. It is hosted by Fred Savage, and returns to ABC on Friday, October 5 at 9 p.m.
TO: That is an emphatic no. Why not? FS: Because a sandwich has a top and a bottom. A hot dog has a side, and a side. TO: So the issue is horizontal vs. vertical? FS: It has to have a top, and a bottom, and two open sides. So I would argue that even a hoagie, if it’s not sliced all the way through, then that’s a hot dog. TO: A hoagie is a hot dog? FS: I guess it’s a hot dog. A sandwich has got to have open sides, and a roof and a floor. Anything else is something else.